Scroll to bottom for video. 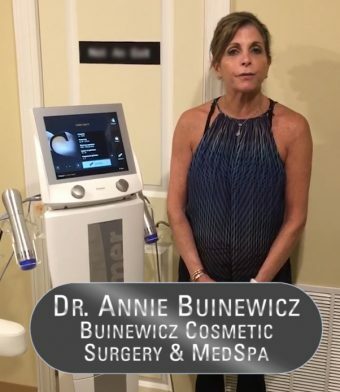 Buinewicz Cosmetic Surgery & Med Spa uses their new Z Wave Radial Pulse Technology device for numerous applications. In the below video, Dr. Annie Buinewicz stood beside the ZWavePro model and outlined some of those uses. Dr. Annie Buinewicz provided this video and comments about Zimmer Z Wave without receiving compensation of any kind. Scroll below to view Z Wave testimonial video by Dr. Buinewicz. Buinewicz Cosmetic Surgery & Med Spa is headed by Dr. Annie Buinewicz and Cosmetic Surgeon, Dr. Brian Buinewicz. Originally board certified in family medicine, Dr. Annie Buinewicz has been practicing medicine for over 25 years. Today, she carries her family medicine approach over to the cosmetic practice, assessing the overall health and wellness of each patient. She is certified in laser treatments, dermal fillers & injectables and performs non-surgical procedures for skin tightening and fat reduction. Dr. Brian R. Buinewicz has been practicing plastic surgery for 23 years. He is performs a variety of cosmetic surgery procedures and is artfully skillful in complex breast, abdomen and cancer reconstruction procedures. The Buinewicz’s practice offers cosmetic surgery procedures for men and women. Surgeries for the face and body include tummy tucks, liposuction, labiaplasty, thigh lift, breast enhancement, rhinoplasty, eyebrow lift, chin implant, facelifts, gynecomastia, and much more. The offices also offer a full array of MedSpa services such as acne treatment, skin tightening, dermal fillers & injectables, light & laser treatments, sclerotherapy and microneedling. Additionally, the clinic treats concerns such as sexual rejuvenation for men and women, laser tattoo removal, PRP (Platelet Rich Plasma) and hair restoration. Buinewicz Cosmetic Surgery & Med Spa has two offices, one located in Doylestown, PA and the other, in Flemington, NJ. You may call the office or visit www.BuinewiczPlasticSurgery.com for more information about their services and treatments. You may also learn details about the practice’s Z Wave treatments on its web page dedicated to providing information about the technology. The Zimmer Z Wave transmits powerful sound waves into the tissue. The energy then spreads out radially to enhance the treatment effect (Radial Pulse Therapy). The body responds to these sound waves with increased metabolic activity in the form of lymphatic drainage and increased blood circulation. The result is an improvement in the appearance of cellulite and improved results when used with other body contouring procedures. For more information about the Z Wave, visit a web overview of the product. You may also contact Zimmer any time by phone or email.